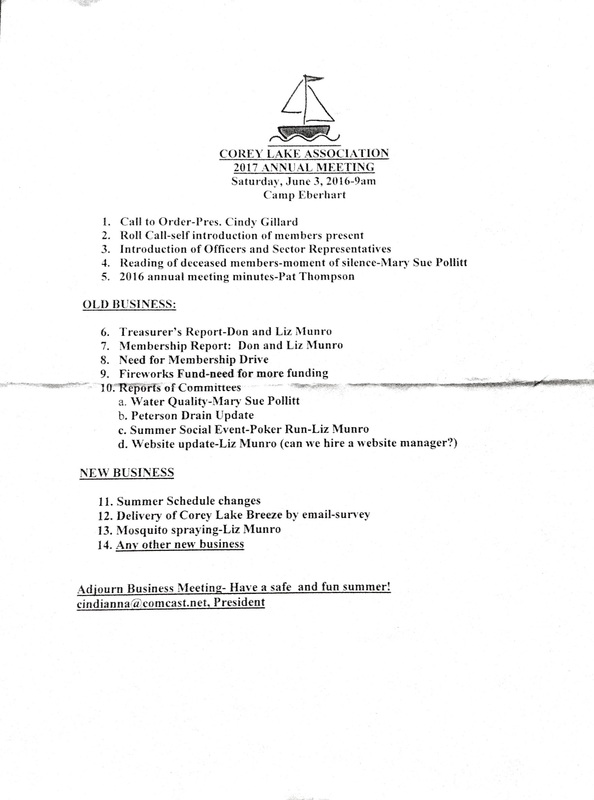 Membership in the Corey Lake Association costs $22 per year. These funds are used to help the CLA monitor the water quality of the Lake, arrange and host various events & activities along with covering related administrative and or insurance costs. Members have the option of purchasing a discounted subscription to The Michigan Riparian Magazine for $14, which would otherwise be $25. As of 2019, the Riparian Magazine subscription has been separated from dues fees due to its increased costs. Options for the subscription are available on our online e-commerce page. Members who wish to pay electronically may do so using our new online e-commerce page. Members are able to conveniently use a credit card or an Amazon member account for transactions. Please note: as we are a non-profit organization, the fees associated with using the e-commerce feature will be passed along to the user at check out (3% of total charges + .31 cents). Thank you for your understanding on that. Should you wish to avoid convenience fees, payment by check is welcome as indicated below. Please encourage any of your neighbors who are not Members to join the CLA, our e-commerce feature is convenient, fast and EASY! Members make separate voluntary donations to the Camp Eberhart firework’s fund and to the St. Joseph County Dive and Rescue. Members who wish to donate electronically may do so using our new online e-commerce page. Members are able to conveniently use a credit card or an Amazon member account for their donation transactions. Please note: as we are a non-profit organization, the fees associated with using the e-commerce feature will be passed along to the user at check out (3% of total charges + .31 cents). Thank you for your understanding on that. Should you wish to avoid convenience fees, donation/s by check/s are welcome as indicated below. All Fireworks are funded with donations, so please help support this great event and encourage others you know to do so too!! Non Members are encouraged to consider making a donation as well. Note: Member year 2019-2020 begins May 1.